In this chapter we see wickedness grow. The mob was at Lot’s doorstep and demanded him to hand his guests over. Lot in exchange to protect his guests was ready to give up his daughters to the crowd. Lot though was saved because Abraham had pleaded to God for Lot. We can deduce from this chapter that Lot had compromised to the point that he was almost useless to God. Lot’s hesitation to obey God stems from the false attraction of the city’s pleasure. 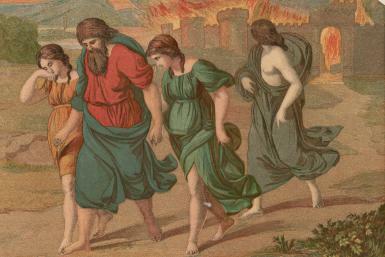 Lot’s wife turned back to look at the smoldering city of Sodom. Clinging to the past, she was unwilling to turn completely away. And the two daughters of Lot who were compelled to pressure their family line were driven not by lust, but by desperation. Have we too become useless to God because we are too much like our environment? Are we looking back longing at sin while trying to move forward with God? Are we desperate as the daughters of Lot? To make a difference, we must first decide to be different in our faith and our conduct. We can’t make progress with God as long as we are holding on the pieces of our old life. We are most likely to sin when we are desperate for what we feel we must have. 1 The two angels came to Sodom in the evening, and Lot was sitting in the gateway of Sodom. When Lot saw them, he rose to meet them, and bowed down with his face to the ground. 3 But he urged them strongly; so they turned aside to him and entered his house; and he made them a feast, and baked unleavened bread, and they ate. 7 and said, “I beg you, my brothers, do not act so wickedly. 9 But they replied, “Stand back!” And they said, “This fellow came here as an alien, and he would play the judge! Now we will deal worse with you than with them.” Then they pressed hard against the man Lot, and came near the door to break it down. 10 But the men inside reached out their hands and brought Lot into the house with them, and shut the door. 11 And they struck with blindness the men who were at the door of the house, both small and great, so that they were unable to find the door. 12 Then the men said to Lot, “Have you anyone else here? Sons-in-law, sons, daughters, or anyone you have in the city — bring them out of the place. 14 So Lot went out and said to his sons-in-law, who were to marry his daughters, “Up, get out of this place; for the LORD is about to destroy the city.” But he seemed to his sons-in-law to be jesting. 16 But he lingered; so the men seized him and his wife and his two daughters by the hand, the LORD being merciful to him, and they brought him out and left him outside the city. 19 your servant has found favor with you, and you have shown me great kindness in saving my life; but I cannot flee to the hills, for fear the disaster will overtake me and I die. 21 He said to him, “Very well, I grant you this favor too, and will not overthrow the city of which you have spoken. 22 Hurry, escape there, for I can do nothing until you arrive there.” Therefore the city was called Zoar. 23 The sun had risen on the earth when Lot came to Zoar. 26 But Lot’s wife, behind him, looked back, and she became a pillar of salt. 28 and he looked down toward Sodom and Gomorrah and toward all the land of the Plain and saw the smoke of the land going up like the smoke of a furnace. 29 So it was that, when God destroyed the cities of the Plain, God Abraham, and sent Lot out of the midst of the overthrow, when he overthrew the cities in which Lot had settled. 30 Now Lot went up out of Zoar and settled in the hills with his two daughters, for he was afraid to stay in Zoar; so he lived in a cave with his two daughters. 31 And the firstborn said to the younger, “Our father is old, and there is not a man on earth to come in to us after the manner of all the world. 33 So they made their father drink wine that night; and the firstborn went in, and lay with her father; he did not know when she lay down or when she rose. 35 So they made their father drink wine that night also; and the younger rose, and lay with him; and he did not know when she lay down or when she rose. 36 Thus both the daughters of Lot became pregnant by their father. 37 The firstborn bore a son, and named him Moab; he is the ancestor of the Moabites to this day. 38 The younger also bore a son and named him Ben-ammi; he is the ancestor of the Ammonites to this day.